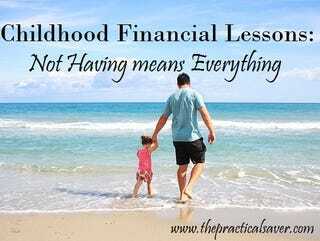 This “What Not Having Means Everything” post details my childhood financial lessons resulted from being in a family that did not have money. In this post, I explain my life as a child and how my experiences allowed me to be a better person and become a financial savvy, practical individual that I am now. I explain how I value the difficulties in my life and turned these into opportunities. Some may call my story as a story of hardship but I proudly call it as a story that changed my life for the better. Not a lot of people were born with silver spoons in their mouth. Not many would say that they had a lot of money growing or that their parents spoiled them on things that they wanted. I know I wasn’t that kid. Having said this, I did have great childhood years and what I experienced in those years helped me become the financially responsible person I am today. I was born, raised, and educated in the Philippines. We were 9 in the family (not including my mom and my dad). I was the youngest of 9. My mom was a homemaker and never worked her entire life so she could take care of us. My father was a tricycle driver and horse race bet runner (i.e. he got all the people’s bets and ran to the racetrack booth to buy the tickets for them). He was earning less than a dollar, which wasn’t enough to feed a very large family. We didn’t have a lot. As a fact, all we had, back then, was a big, happy family and a never-ending debt. Nevertheless, we survived and almost all my siblings graduated. It was during my childhood years that I learned the best lessons I have ever learned in my entire life. It was my experiences during those challenging years that helped me become a frugal, financially savvy person. Here are the childhood financial lessons that I learned during my childhood days. I remember the times when we didn’t have any food on the table because my dad hadn’t gone home to bring money to buy food. I remember my mom would make rice mixed with sugar and powdered milk for me. That was my meal for the day. My mom was resourceful and made sure that the youngest in the family, which was me, was the first one to eat even when the meal wasn’t really a complete meal. I was appreciative of what she gave me and loved every meal she prepared. She was creative and resourceful and I learned those traits from her. Up to now, I consider these as among the best childhood financial lessons I’ve ever learned. Just like many great dads out there, my dad was a great dad to the family. He would come home with a smile on his face after a day of driving his rented tricycle and running bets of other people. He was happy that he made a little bit of money to feed our family. It wasn’t much but his efforts spoke how hard he tried to make a living for his family. For me, at the end of day, what he did was worth more than what he made during that day. We survived the day and that was more important to us. My school didn’t have a bus system that we have here in the US. I would always walk half a mile to go to school and half a mile to go home from school. Walking was my routing every day for almost 6 years. I chose to walk instead of taking transportation because I knew that the money would be better spent in food, allowance for my brothers and sister who were in college, among others. I learned how to value money early on in life even when my family didn’t have enough money. I would go to school not having the right amount of money to feed myself for a day. During those years, bringing dinner leftovers were not possible because we didn’t have enough food for the family the night before in the first place. So how did I all my lunch food or how I got money to buy food? Well, I tutored my classmates, back then, in exchange for some peso coins. I would do that almost every day. It was during those years that I learned how to make money out of my knowledge and skills. I carried all these learning all the way to college and served me really well. I remember making my own toys. While a lot of kids who lived close to where I lived had Atari, which was big during my childhood years, I was making paper boat and planes, creating paper mache, and playing mini-cards with my good friends. My friends and I would make kites and flew them high up in the sky. We would play “Patintero” and “Luksong Baka”, which are traditional Filipino outdoor games. We were just as happy as the kids who were playing the Atari. It was during those years that I learned all my social and communication skills. I wish my nephews and nieces or my daughter could experience that but kids nowadays have been glued to television and technological gadgets. Oh by the way, it was during those times that I learned DIY (i.e. paper mache, boats, and planes) when the word DIY hadn’t been really coined during that time. During my childhood years, I was a cub scout. I remember that there were times that all the Cub Scouts had to dress up because of ceremonies and activities. My classmates would always buy all those Cub Scout uniforms and accessories. I, on the other hand, couldn’t and wouldn’t buy because I didn’t think that uniforms were something that I wanted to spend money on. I would always be the odd person in our school during Cub Scout activities because I was wearing my brothers’ ROTC uniform, which looked big on me but I didn’t care. Some weren’t really nice to me especially a couple of my classmates. I knew my uniform was different, knew why they were whispering, and who they were talking about. But I didn’t care because I got through the ceremony just fine. I didn’t have to explain to them why I dressed up like that. Some of my classmates didn’t get to attend because they didn’t have money to buy the uniform and/or didn’t want to wear whatever they had. I was the odd one, I guess. I knew that being a Cub Scout wasn’t just about having the uniform and accessories that went along with it but was also about being creative and resourceful. That’s what I showed my Cub Scout days. My teachers were proud of me because of made something out of what I had. Being creative and resourceful were among the best childhood financial lessons I’ve ever learned. I remember me and my friend would to different areas near where I lived to look for metal scraps that we could sell to the junk yards for a little bit of money. I remember myself asking for old newspapers and used bottles from my neighbors so I could sell them to the junk shops. I did that because I wanted to buy some snacks that I wanted to eat and some toys that were cheap enough that I could buy with what I earned from selling metal scraps. Yes, I was still a kid who wanted to eat junk foods and buy toys just like any other kids. Since my family didn’t have enough money, all I could do was make money on my own. I’m not talking about child labor. I was looking for metal scraps out of the want to have money and out of fun trying to find something with value (more like a treasure hunt). This was one of the activities that my friends and I would do. I was that kid who didn’t really ask for money from parents. I was the kid who found his way to making money out of what other people called as trash. This is one of the best childhood financial lessons I’ve ever learned. If there’s any other consolation aside from earning money, I did learn a lot about what’s considered metal or non-metal and which metals had more value and which ones were simply trash. When I was a kid, the only time that my family or a few members of my family could go out for vacations was when my sibling(s) had company outings or picnics and when my family visited our cousins. That was it. There were no Disneyland and out-of-the-country trips just because it was impossible to do those given our money situation. We did, however, spent time going to free parks, free beaches, and we were just as happy as those families who went on vacation that involved spending (well, I think). We would bring some snacks and would be there for half a day and we would go home. There was nothing fancy and different about our mini-vacations but these vacations were centered about family bonding. Having said that, our family always had fund and that’s all that really mattered to us. Life was simple then and I loved it. Things are different nowadays. Consumerism has really crawled into the lives of people that these people find taking vacations, which cost a lot of money, as a necessity. Having said that, my experiences during my childhood years allowed me to appreciate my family and to appreciate the simple things in life that always make me really happy. I like to teach my own family especially my young one about having a simple yet happy life. I like for my daughter to know and understand that there are free things in life that can make her happy. This is one of the childhood financial lessons I want my daughter to learn. Though we didn’t have money, almost all of us in our family graduated with a college degree. You may ask how my parents were able to put us through college. The answer is a combination of domino help, part-time jobs, and scholarships. Most of my siblings got scholarships to go to college and some also worked part-time. I did get into a prestigious school in the Philippines and only paid around $2 per year for 4 years. So what about the domino help and how did it work? Well, when my eldest sister finished college, she took a job and helped my oldest brother finished his degree. Then, my oldest brother helped my other brother to finance his school allowances and fees, and so on. A lot of people were amazed on how most of us finished college when we didn’t have money at first and the cost of education was expensive that parents could not send even one of their kids to school. I learned early on in life that helping can tremendously impact the lives of those who you help. I carried this lesson up to now. Whenever I have an opportunity to lend help, I do it without hesitation and without asking in return. This is one of the best childhood financial lessons I’ve ever learned. I was once a kid who needed help and my family was there to help me. Now, I’m not just helping my family but also those who need help regardless of my affiliation with them. If I had to sum up my life as a child, I would say that it was one of the best phases of my life. Though I didn’t get to experience even the smallest luxuries in life back then, I was thankful that I got to experience the most valuable lessons in life and that’s not just about money. Even when my family had nothing, I learned how to be resourceful, creative, patient, and disciplined. In a very young age, I learned how to value what I had and to continue to perseverance despite all the challenges that came my way. My family may not have the money but we had each other and we worked our way to where we are bow because we remained as a family all the way. How I wish my daughter, nephews, and nieces were alive during those years to see how we made it through without feeling destitute and sorry for ourselves. I can’t imagine re-setting my life all over again and find another life to experience. I was brought in a family who was an epitome of a great, loving family. The lessons I learned in the past truly define and continue to define me as a person, husband to my wife, father to my kids, uncle to my nephews and nieces, and so many roles. These experiences helped me become the financial savvy, practical, and appreciative person that I am and a lot of people around me are and will be proud of. Read: Needs vs. Wants: Why It’s Difficult To Distinguish One From The Other?